This content is provided by Charles Wells. Why partner with a family brewer? When taking on a pub, it’s important to find a business partner who understands and shares your vision, and who can provide valuable tailored support. If you know the geography within which you wish to operate and are keen to work with a small to medium-sized business that has carefully nurtured and improved its properties for generations, a family brewer could be the perfect fit. The Independent Family Brewers of Britain (IFBB) focuses exclusively on family-owned and family-run businesses; their 29 members are companies that positively invest in their pubs and in their people, and who are fully committed to the training and development of their tenants and managers. A combined brewing experience of 4,500 years make the UK’s family brewers an integral part of its heritage. Bedford-based Charles Wells have grown a small family business founded in 1876 into one of the UK’s most respected pub companies and brewers. A proud IFBB member, it remains a family business, with the fifth generation of Charles’ descendants now firmly at the helm. It’s vital that Pub Partners and their teams are provided with the training support needed to offer their business the best chance of success. Applicants interested in taking on a Charles Wells pub prepare business plans which set out how they intend to operate their business; the identification of areas in which they would benefit from some targeted training is a key part of this process. A bespoke 12-month training plan is then developed for each Pub Partner. Particularly noteworthy is Charles Wells’ Best in Glass (BIG) in-pub training programme, aimed at ensuring that beer quality is second to none in its sites. The BIG scheme ensures that operators are not only serving the best possible pint but also maximising yields in order to drive profit, while encouraging a proactive approach to cellar best practice and regulatory compliance. A tie-in with Cask Marque sees each graduating site achieve their industry benchmark accreditation in the process. Running your own pub can be a (very rewarding) challenge. 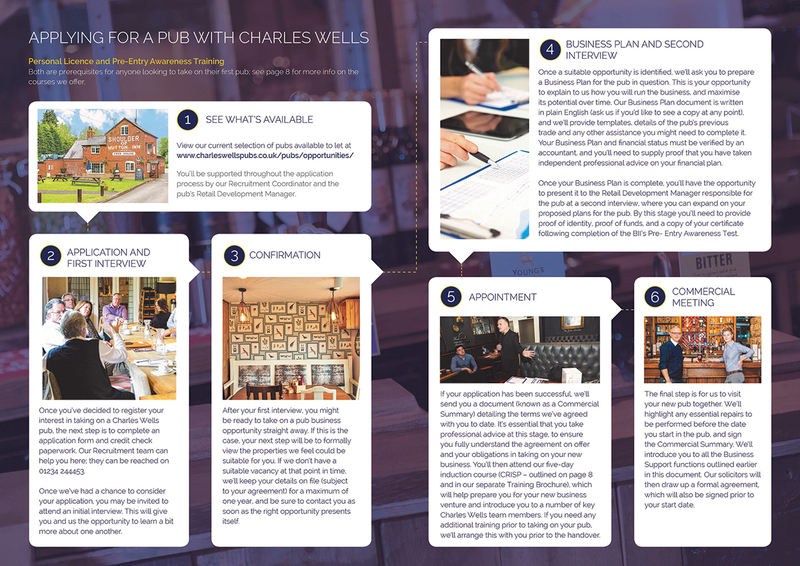 With Charles Wells you’ll benefit from a support package tailored to your individual needs, helping you to look after your pub and grow your business. Your Retail Development Manager (RDM) will act as your primary point of contact with Charles Wells. They’ll be on hand to offer business advice, ideas and information to help you build your pub’s trade and maximise your profits. With experience of your product range and the opportunity to share best practice between our Pub Partners, your RDM will become a key ally as you make a success of your business. The Customer Support Team functions as a central point of contact, assisting with such issues as property repairs, product orders, legal compliance queries and requests for glassware or marketing materials. The Property Development team are focussed on the ‘bricks and mortar’ of your pub; they ensure that your property is fit for purpose and will allow you to deliver on your business objectives. It may be that a development or refurbishment project forms part of the initial agreement for your new site; if so, you’ll be assigned a Project Manager who will work alongside you for every step of the process. Meanwhile, the Commercial Services team co-ordinate and process all licensing applications on your behalf and assist in any licensing issues or disputes that may have an impact on your business. This coordination service is provided free of charge as added value support to your business. Charles Wells also provides a buildings insurance policy that they believe offers you the most competitive rates. What’s more, you’ll have no excess liability to pay in the event of a claim. From reviewing your initial Business Plan, to day-to-day business-building support once you’re happily installed in your pub, our Retail Sales & Marketing team have a wealth of experience and knowledge to offer. If partnering with a family brewer has piqued your interest, the good news is that you’re likely to be dealing with an organisation that’s personable, responsive and motivated to make the application process as accessible and pain-free as possible.